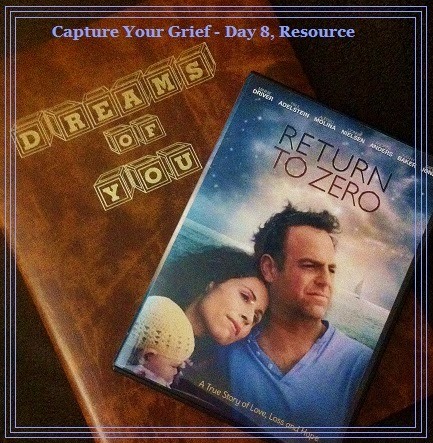 Resource, that is today’s prompt for Capture Your Grief. At this point, I have found a number of very good resources that have been a huge help to me after losing Faith. I am doing to focus on two of those resources that direct me to the most important resource, on this post. The first resource that has brought me much help is Sufficient Grace Ministries. Their Dreams of You package including a Comfort Bear, Dreams of You book, and other great items has brought me much comfort for my journey. They are doing a wonderful thing reaching out to so many people who have lost a baby or babies. By sharing their faith with others, they have brought me joy in celebrating my Faith. The second resource that has been very informative and healing for me is the movie, Return to Zero. My most sincerest thanks go out to Sean and Kiley Hanish and all the actors as well as everyone involved in the making of the movie, for their courage to speak out. If you have not seen this movie, I highly suggest that you do. While it is a VERY difficult movie to watch, it is so well done and shines light on so many things involved in losing a child. Both of these great resources lead me to God, and remind me of His agape love for us all. While I am on this journey of grief, that will remain part of me until I go home, He is always there for me to love, comfort, and heal me. In summary, of all the many resources out there to help with my journey in life after losing Faith, the most prominent and most important is God. He is my resource.